I gave you a brief overview of the basic features of the Google App Maker in my previous post, and now I want to look at the scripting possibilities. The App Maker supports the creation of both client and server scripts. Client scripts run in the user's browser and can access DOM elements, the browser's local storage and more. Since client scripts may be manipulated by more experienced users, we are not allowed to use application logic that is impacts data security or consistency. I want to extend our demonstration application example from my previous post. When you click on a button, the current number of employees will be read from our data model and displayed in the form of a small text note or label. Next, we will add a new ClientScript, and write the code to retrieve the number of employees from the data model and display it in the label widget. 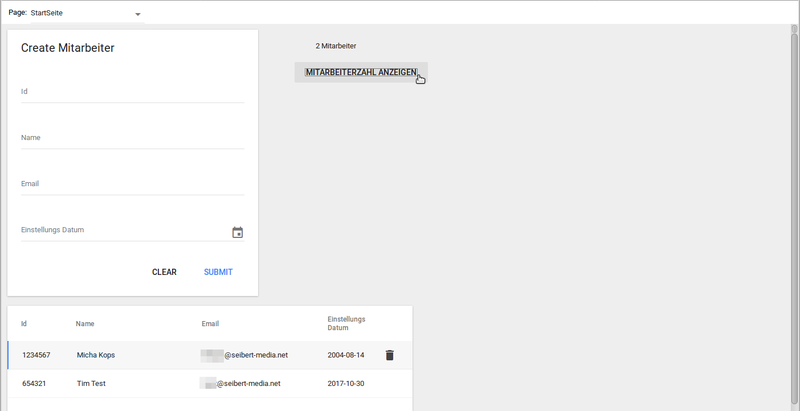 Switching to preview mode, you can click the button "Mitarbeiterzahl anzeigen", and the label above will show the number of existing employees as expected. Server scripts are stateless, run on distributed server systems and may be subject to usage restrictions (daily quotas). In the following example, we want to be able to send an email notification to all existing employees. We can now extend our existing client script to also call a function in a server script. Server scripts can be called from a ClientScript by running them with Google's Script Runner. This gives you the option to react to errors or the success of the actions within the script. We then create a new ServerScript. That's it for our two-part introduction to app creation for G Suite with Google App Maker and a quick look at some of the scripting options. Do you have any questions or comments? Do you want to extend G Suite with customized apps to meet your specific needs? Please contact us! Want to learn more about G Suite? We are your Google Cloud Partner!